From Underground Toys! 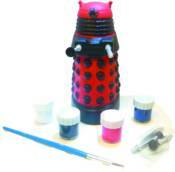 For Doctor Who enthusiasts and collectors everywhere, here's your chance to create your own ceramic masterpiece with acrylic paints on quality pottery. The TARDIS and Dalek ceramic money banks come with stickers and accessories to complete your time traveling experience. Each comes with a paint brush and paint so you can bring them to life. The TARDIS stands 8 5/8' tall, and the Dalek stands 5 1/2' tall.